Many of us have gotten in the habit of drinking more water (and trying to get our families to do the same) in lieu of sugary sodas and juices. Sure, water isn’t the most exciting beverage, but it’s a smart choice for health and wellness. Today’s Grommet makes the prospect of drinking water even more appealing by giving it a welcome shot of flavor. Flavrz is a concentrated drink mix that you add to ordinary drinking water. It tastes great without any artificial flavors, colors or preservatives. Flavrz is made from organic fruit juice, fruit extracts, and fruit flavorings, and it’s lightly sweetened with agave nectar. Greg MacArthur, the finder of Flavrz, believes these are perfect for the health conscious consumer. The company was founded by Karen Barth, a nutrition-conscious parent who was frustrated by the lack of healthy beverage options for her family. Besides focusing on healthy ingredients, Karen also gave a lot of thought to responsible packaging, choosing reusable glass containers so the materials won’t leach into your beverages. Flavrz offers a range of flavor options, including Cola, Ginger Ale, Root Beer, Tropical, Cherry Berry and Lemon Lime. (If you prefer a bubbly beverage, you can pair Flavrz with another favorite Grommet of ours, the Twist 'n Sparkle carbonation system from iSi. )The net effect of these water flavor-boosters is instant palate appeal. Hello! I am Karen Barth and I am delighted to be here today. I started Flavrz because I knew there had to be a tasty, economical, natural, healthy, waste-reducing alternative to the rows of chemical and preservative filled soft drinks and sugary juices that line the grocery shelves. Flavrz is it. It tastes great, too. It took me 3 years of perfecting the recipes to make sure you'd love it. It's a lot like familiar drinks but even better because real ingredients taste better than chemicals without the need for added sugar. I am looking forward to hearing your comments and answering any questions you have. Flavrz is a great product. Fits all channels of trade. Easy to use and taste good too! Grommet, I've not heard of a product like this before. I love it. I particularly like the idea of using Flavrz along with the iSi sparkling water that I can make at home. What a perfect combination! I'm going to buy some Flavrz now. Thanks for this Grommet. This is such a great idea, finally someone has come up with a healthy alternative for our kids. It seems so obvious, Coke Cola should be nervous! Can I ask (just to be sure) -- do the cola and root beer flavors have caffeine? This sounds like a great idea, and I'd like to try all the flavors but I don't like giving my kids caffeine. "Things that have caffeine can be extracted for flavor or for caffeine. Our Kola extract is made for flavor. It does contain a tiny residue amount of caffeine. Our flavoring company estimates that an entire bottle of Flavrz would contain less than 2mg of caffeine and versus 80-120mg in a typical cup of coffee. So an 8 ounce serving of Flavrz Cola would contain about 1/10 of a mg. Legally that is well below the limit for being considered caffeine free and would be easily tolerated by even the most caffeine sensitive individuals." I think your product is awesome Karen! Could I get nutrition type information that is usually found on all food now? @Sally Eynon: We are working on getting this posted on the site--standby. In the meantime our Fruit Flavors have 35 calories and 9 grams of sugar and 9 carbs at recommended strength and 100% RDA of vitamin C. All the rest of the Nutritional Fact amounts are 0 (no fat or sodium or protein). 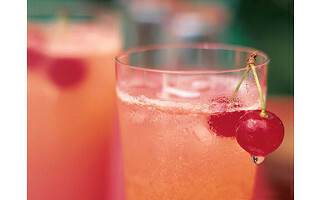 The fruit flavors are made from fruit juice, water, agave, cane sugar and fruit flavors and extracts. All are organic. They also contain ascorbic acid (added vitamin C) and citric acid. The sodas are similar but they contain less fruit juice and more botantical extracts like kola nut, ginger, vanilla, cinnamon extracts, etc. The sodas also contain just a big of organic stevia. 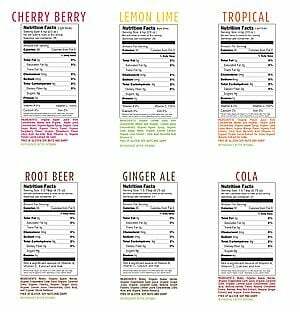 @Sally Eynon: Nutritional Information: Here is the nutritional information for each of the Flavrz. If you click on this image, a pdf will open that you can read. Great questions. Karen will be here momentarily to respond, thanks! This sounds like a good idea, but to truly be healthy no sugar should be used (no, Agave Nectar is not the health food it's made out to be). Stevia or lo han should be used. I eat low carb and I'm so tired of the sugar in everything. Sugar (& refined carbs) causes weight gain and inflammation in the body and that is the root of most illness and disease. Agave, like other alternative organic sweeteners (honey, maple syrup)should be eaten in moderation but we like it because it doesn't spike blood sugar, which is important for all of us, and especially for kids. Stevia is a nice sweetener but when used as the main sweetener it has a bitter taste that many people don't like. I'm curious what amount of the Fruit Juice you add to each glass (say 8oz)... I'm trying to figure out how many servings you would get out of each bottle of your Fruit Juice. @EBC: One of the great things about Flavrz is that you can add as little or as much as you want to each glass. Our "recommended" level is 1.5 tablespoons per glass. This makes a lightly sweetened drink. 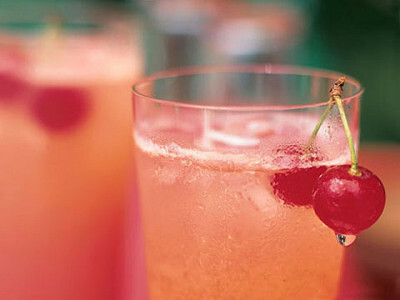 If you are used to typical American drinks you'll need about 2 or 2.5 Tablespoons. The fruit drinks taste great with as little as a teaspoon if you'd like to make a flavored water. Most customers (based on our survey of users) get 16-32 servings from a bottle. why wouldnt you include the calories and other details like a complete list of ingredients ? why is this better than just mixing organic fruit juice with water ? @dede: A complete list of ingredients is coming up. When I invented this product our family was diluting juice with water but my kids refused to drink it like that. They complained that it tasted watery and personally, I agree. Flavrz is an invention in this sense, design to solve this problem. We add back in flavor and sweetness, still keeping to the calorie level of diluted juice. So it tastes really good and refreshing but with the same basic nutritional profile of diluted juice. @dede: Here is the nutritional information for each of the Flavrz. If you click on this image, a pdf will open that you can read. I am from the UK and we have loads of these types of products there - I hate the ready-made (sugar-filled) juice here in the US and I actually spend $6 a bottle to buy a UK brand of diluting juice (that's what we call it over the pond) in grocery stores here - at home, the same bottle would cost about $1.50, so I know I am being ripped off. Why is there no other diluting juice in the US?? This sounds delicious and healthy (probably healthier than the UK brand I buy here) but it also sounds expensive and I don't want to have to buy my juice online only. The only similar US alternatives in stores are horrid and totally unhealthy - like most of the rest of the processed 'food' available. Sorry, moan over. Glad to see someone is trying to make a change and that others are also hating current options. @Wendy: Good question. You would think that concentrates would be more popular, but companies here in the states struggle to communicate the value and process of concentrates. Without water dilution, you are getting more with less space and waste. We are looking to Karen and Flavrz to lead a concentrate revolution for the beverage industry and beyond. @Julia Kemp - Daily Grommet Discovery Team: Is Flavrz available to buy in any shops yet or is it too early in it's distribution development? @Wendy: They do have some distribution in the Northeast at stores specializing in natural food and nutrition. @Wendy: My husband is from the U.K. so I've spent a lot of time there. I've been amazed at the popularity of liquid drink syrups. Flavrz has taken this idea to a new level, with something healthier and better tasting. It is really catching on with Americans. As far as the price, Flavrz is made from premium, high quality, fruit-based ingredients grown without pesticides and processed without chemicals. The syrups on sale in the U.K. are chemical based as is the new Mio product that has been advertised alot in the U.S. What is important to keep in mind is that Flavrz costs between $.20-.45 per 8 oz serving which is less than any other organic or all-natural drink on the market. @Annette Kramer: It's really fun to make your own combinations of different flavors. I like the ginger and lemon/lime together. Cherry/Berry and Cola is also really fun. Very informative and well thought out video. Good job on such a great health conscience product! I have tried your products I think they are great. I love the fact that you can adjust the flavor. this is really a fun product for all ages; we had 8 adults who had a blast mixing the Flavrz to their own preferences along with commenting on each others. the root beer is my personal favorite! This product is great! I've tried other water-flavoring products, and they are usually too sweet or just don't taste good at all. Not to mention they are often loaded with artificial sweeteners. Flavrz tastes great and doesn't load you up full of artificial junk. Try the Cherry Berry. It's great! Nice job on the video! I love these products, and they DO get me to drink more water and less junk-filled drinks. I will ask for it in stores! My family also loves FLVRZ. Its really great to have a natural alternative to the "diet" drinks industry. @David Rosen: I'm glad you like Flavrz. It is really a great diet product because it gives you some satifying sweetness with only 35 calories. Recent studies have shown that diet soda actually leads to weight gain. Flavrz is a great alternative that also eliminates all the artificial ingredients. Can you please make this with Stevia??? I am looking for alternatives diet drinks too but also to sugars of all types. 9 grams doesn't sound like much but it is to people with advanced Crohn's disease and diabetes, etc. Can you help us??? @Lisa: Thanks for the input. We have on our upcoming product list an even lower calorie version of Flavrz. We are researching different sweetener options that are organic I don't like using too much stevia because I've tested this and find that most consumers don't like the taste very much. In the meantime, try our lemon lime. You can add just a teaspoon to a big glass of water (only 7 calories) and its very refreshing. The gingerale works well as a light drink too. How many servings are there in one bottle of Flaviz? @JoAnna Cousins: You will get 16 to 32 servings depending on how strong you prefer your flavor. agave nectar is worse for you than high fructose corn syrup and more expensive to produce. @keeley: I'm so glad you raised this issue because there is so much misinformation going around about agave, much of it started by one Dr. Mercola. I love the internet but sometimes the internet can contribute to the passing around of misinformation until it begins to seem like fact. Quoting from the Global Health Center website: "There is no comparison between a natural form of fructose, such as in fruit or from agave, and the chemically-processed, pesticide-laden, genetically-modified High-Fructose Corn Syrup (HFCS)...the enzymatic processing of agave is very different from the process of High-Fructose Corn Syrup, which fabricates fructose out of the glucose made from the milled starch of corn." There is not one credible study that shows harmful effects from agave. One highly sensationalized study found that feeding large amounts of agave to diabetics cause them some serious problems. So if you are a diabetic, you should not eat large amounts of agave (or for that matter any other sweetener with fructose or sucrose). If this wasn't obvious before, it is now. If you are not diabetic, there is no reason to avoid agave. Mexicans have been eating agave for centuries. It was used in their traditional medicine for digestive support, as an anti-inflammatory and a blood purifier. I also note that agave is sold in Whole Foods and most health foods stores around the country. These companies have staff members researching the safety of the products they sell. What we like about agave is that it is 25% sweeter per gram of sugar so you get more of a sense of sweetness in taste with fewer grams of sugar. This combines with our premium flavorings to fool the taste buds into thinking that a 35 calorie drink tastes as good as a 100 calorie drink. For more info on agave see the following links that provide a balanced view: http://www.globalhealingcenter.com/natural-health/agave-nectar/ http://www.naturalnews.com/025060_agave_nectar_sugar_sugars.html I hope this helps clarify why we love agave as a sweetener. A great product! My kids love it too! I just tried to order the 6-pack and was stunned by the shipping cost - $47! I live in Alaska, yes, but other companies manage to ship equally heavy, equally fragile things for much more reasonable prices. Many of us have gotten in the habit of drinking more water (and trying to get our families to do the same) in lieu of sugary sodas and juices. Sure, water isn’t the most exciting beverage, but it’s a smart choice for health and wellness. Today’s Grommet makes the prospect of drinking water even more appealing by giving it a welcome shot of flavor. Flavrz is a concentrated drink mix that you add to ordinary drinking water. It tastes great without any artificial flavors, colors or preservatives. Flavrz is made from organic fruit juice, fruit extracts, and fruit flavorings, and it’s lightly sweetened with agave nectar. Greg MacArthur, the finder of Flavrz, believes these are perfect for the health conscious consumer. 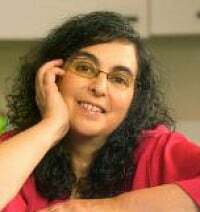 The company was founded by Karen Barth, a nutrition-conscious parent who was frustrated by the lack of healthy beverage options for her family. Besides focusing on healthy ingredients, Karen also gave a lot of thought to responsible packaging, choosing reusable glass containers so the materials won’t leach into your beverages.